Careem is very famous in Pakistan for its humorous marketing campaign, be it rishta aunti or Bakra online, Careem has always brought Something new for people. However, this time things have gone wrong with Careem unexpectedly. 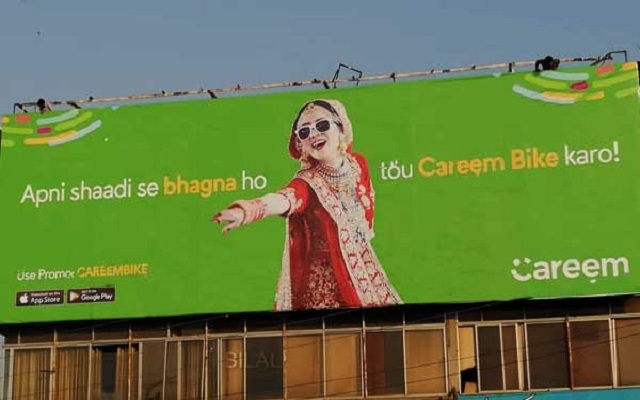 Careem had launched its Careem bike campaign a week ago, the campaign was very good and well-designed however there was one billboard which focused on a bride with a tag line” shadi se bhagna ho tou careem bike karo”. Not everyone liked this board and people took to social media to show their displeasure regarding this post. Even the Interior Minister called CEO of Careem to discuss the ongoing marketing campaign. Now a petition is filed at Islamabad high court against ride-hailing service, Careem for the immoral billboard. The name of the petitioner is Rashid Umar who said that the ride-hailing services have hurt the religious sentiments of Pakistanis. The petition asked the court to order an issue to ban such immoral billboards which are against the code of conduct of Pakistan. It also issued directives that PEMRA should ensure the implementation of such laws. However, some good tag lines were also part of this campaign. Moreover, recently, this ride-hailing app has made some changes in the way they receive payments. So you will see now a Change in a Careem Fare Policy.